Perhaps it was the wonder of magician Doug Henning’s TV specials that I saw at an impressionable age or maybe because I was given a Presto Magic Show Set (complete with magician’s performance table! ) when I was 5. Whatever the reason, I am sort of predisposed to enjoy films about magicians. Not since 2006 have we had such an influx of movies regarding the profession: both The Prestige and The Illusionist came out. That was a banner year. I keep hoping another will live up to that high standard. 2013 isn’t that year, but it’s the closest we’ve come since. The Incredible Burt Wonderstone debuted back in March and Now You See Me was released in May. While I thought the Steve Carrel film was acceptable, this one is even better. A super-team of illusionists are brought together by a mysterious manipulator who dubs them The Four Horsemen. This unseen entity gives them the blueprints for an elaborate stage production. Then one day after performing successfully for over a year, they’re playing to a packed house in Las Vegas. For their grand finale the magic group seemingly robs millions of Euros from a bank in Paris. Now it’s up to an FBI officer and his squad to solve the mystery of what happened to the missing cash. A star-studded cast and captivating plot highlight this entertaining escapade. The appealing premise had me instantly hooked. Jesse Eisenberg, Woody Harrelson, Isla Fisher and Dave Franco are charismatic magicians each with different specialties. Arrogant and smug their personalities mesh together well into a slick show. Yet they’re apparently merely the puppets in an intricate scheme to mask the real crime. Mark Ruffalo plays FBI Agent Dylan Rhodes who joins forces with Alma Vargas (Mélanie Laurent) to get to the bottom of this conundrum. Michael Caine is the wealthy benefactor that funds their successful theatrics and Morgan Freeman is the skeptic who debunks magicians on his reality series. Just who is behind the very real disappearance of the money? As the chronicle evolves, the action displays The Four Horsemen’s humorous ability to always stay one step ahead of the FBI and his team. The U.S. agency begins to look kind of bumbling. Now You See Me has a brilliant set up. Over time that semblance of sense gives way to a pretty convoluted third act that will require a willing suspension of disbelief in order to swallow all that came before it. For example the clarification of what actually happens during a car crash is completely ludicrous. The details don’t hold up, but that still doesn’t mean the picture isn’t fun. For a good while, the developments are fast paced and lively. There’s CGI galore to emphasize the style of their illusions. The cinematography is a bit dizzy. A little less spinning camerawork would’ve sufficed. I suppose that’s the art of misdirection at work, but it also imparts a lighthearted panache that never allows the audience to take this subject too seriously. There’s no way anyone could possibly explain the ‘how’ or ‘why’ until the very end, but it’s still interesting enough to hold your attention. Addendum: I was captivated by the premise enough to see this. So were a lot of other people. Only $7M kept Now You See Me from being the #1 movie opening weekend in U.S. That was against Fast & Furious 6 in it’s 2nd week and After Earth in its 1st. I like surprises….especially ones involving magic. Greta Gerwig, star and co-writer of Frances Ha, is a good influence on Noah Baumbach. They met when she co-starred in his 2010 film, Greenberg and their collaboration has now yielded something I can actually recommend. I have always had difficulty warming up to the director’s misanthropic view on life. Except for his work with Wes Anderson, his characters have largely been rather repellent. That’s what makes Frances Ha such a nice surprise. Our lead is a comparatively upbeat oddball, albeit infused with an undercurrent of woe. Baumbach’s pessimistic attitude is still there, but you have the feeling that there’s a light at the end of this tunnel. Frances is a 27 year old living in Brooklyn. She’s an apprentice for a dance company but hasn’t accomplished her dreams to become a full blown dancer. She has a boyfriend, to whom she cannot commit. Conversely she has a very close relationship with her best friend Sophie. However Sophie has recently gotten engaged and is moving out. Now Frances has an apartment which she cannot afford on her own. She attempts to rectify these setbacks with little to no success. Gentle and self-effacing, she charges ahead undaunted by all the curve balls thrown her way. The story is made up of fragmented pieces that yearn to create a fully formed whole, much like our protagonist. Frances Ha is an amiable slice of life drama detailing a totally realized personality. Baumbach has decided to shoot the action in digital black and white. It lends a picturesque polish to an unforgiving portrait of New York. Her daily frustrations take on a whimsical quality. These problems almost seem like fantasy. At times Frances is endearing, and at others, you just want to shake her until she finds some focus. She exists passively going through life with a certain fatalism that can occasionally grow a little annoying. But on the flip side, there is an awkward charm to Frances. Her conversations defined by the actress’s effortless delivery as if she’s making up her dialogue on the spot. Her date Lev, whom she is treating to dinner, asks what happened when she disappears to get cash from an ATM after her credit card is declined. “I’m so embarrassed; I’m not a real person yet,” she sheepishly replies. She is still a child flirting with adulthood, but at least she is forging an attempt. For once Baumbach offers us a sympatric individual. Greta Gerwig has everything to do with Baumbach’s kinder, gentler direction. I give my stamp of approval on this romantic and creative partnership. If Fast & Furious 6 could be encapsulated by a song title it would be Daft Punk’s “Harder, Better, Faster, Stronger.” Well better than parts 2-4 anyway. We’re a long way from the simple charm of the 2001 original. No longer content to limit the vehicles to just automobiles, this installment has got planes, tanks and yes cars too. The Fast and the Furious franchise is about raising the stakes. The series’ somewhat stale preoccupation with street racing was re-invented into a heist film in installment 5. The latter Fast and the Furious sequels have morphed into the Ocean’s Eleven of chase movies. 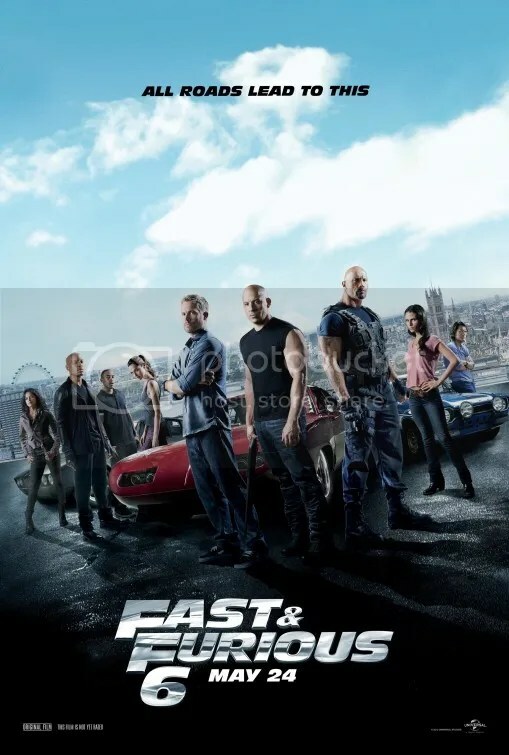 Fast 6 continues that camaraderie by re-assembling Dom and his crew of experts to do another “job,” the takedown of a rogue team of drivers led by a British (natch) Special Forces soldier. The old gang is back including expanded roles for more recent additions to the party. The cast has grown exponentially since the first installment. The script takes for granted you know these characters so it doesn’t waste time trying to define them. You are expected to have seen parts 1-5 and adore these people the moment they appear. An overused narrative shortcut is the obligatory European as the bad guy, Luke Evans as a generic terrorist named Owen Shaw. I guess Mark Strong was busy. Dwayne Johnson shows up wearing a t-shirt purchased at BabyGap. He’s Luke Hobbs, the preening CIA operative who apparently has a lot of free time to spend working out at the gym. How else to account for his absolutely ridiculous pumped up physical frame? Johnson is so seriously inflated he looks as if he were punctured by a pin, he’d just pop. He only recently became part of this franchise with Fast Five, but has since become a key component. Conversely Paul Walker (remember him?) blandly fades further into the background. Oops I almost forgot to mention this boasts the return of Michelle Rodriguez as Letty who died in Part 4. If that sounds impossible, please read on. The narrative has been structured in such a way that the action sequences are the film. In between we get a lot of blah-blah-blah that is a comparative bore to endure until the next assault, These vehicular feats have continued to explode with each successive entry in a seemingly never-ending pursuit to top the last. Physics be damned! Applying logic or sense to any of these pictures is kind of irrelevant but the characters should at least involve our concern. Dom Toretto (Vin Diesel) cannot die. We’re never even remotely worried our hero could be finished. At one point Letty is flung off a tank, Dom leaps, no FLIES through the sky, catches her in mid air then travels to the safety of a second moving car. It’s a display that looks more like CGI than actual stunt work but it also creates a problem. His ability to cheat death kind of removes any tension you might feel. We should be on the on the edge of our seat but we’re no longer concerned. It just feels like routine now. A formula that eschews sophistication in the name of “mindless entertainment.” Should we cheer? My theater did. Most loudly at the end when the entire production builds to the reveal of yet another character – a certain shaved head action star. It’s as if to say, this was all just a tease to the real movie. Now go watch Fast & Furious 7…in 3D no doubt. Kon-Tiki, the Inca god of Sun and storm, was the name of the balsa-wood raft used by Norwegian explorer and writer Thor Heyerdahl. The primitive vessel was instrumental in his 1947 expedition across the Pacific Ocean from South America to the Polynesian islands. The purpose was to show that the South American people could have settled Polynesia in the pre-Columbian era using only the simple materials and technologies available to them at the time. I kept thinking that just because they could doesn’t necessarily mean they did but that’s never addressed. Incidentally most anthropologists now believe they did not but that‘s another discussion entirely. There’s no denying that Heyerdahl was a brave and admirable trailblazer who basically just wanted to prove that you couldn’t rule the possibility out. Their mission was presented in a non fictional account in 1950 that actually won the Academy Awards for Best Documentary Feature the following year. Now it’s been made into a historical drama, which was subsequently nominated for Best Foreign Language Film (Amour received the award). 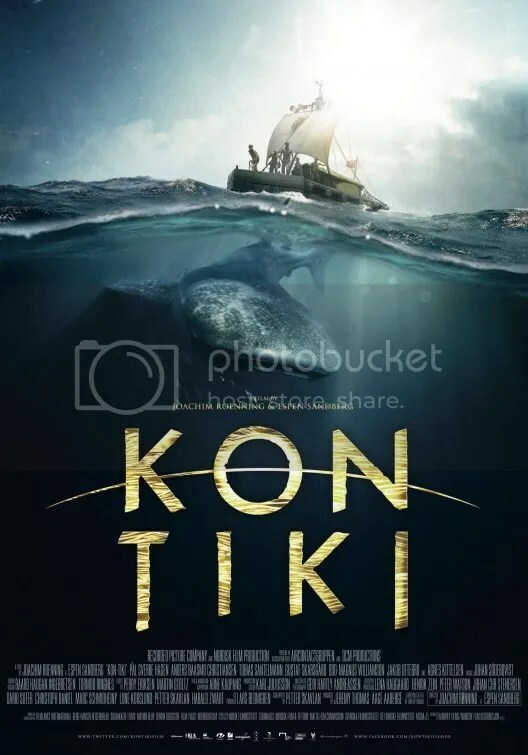 Kon-Tiki is a pleasant but very conventional movie. The plot is mostly made of the 4,300 nautical mile-journey from Peru to Polynesia aboard a flimsy raft. Heyerdahl is a tall blonde tanned Norwegian. His staff is also made up of the same, well four Norwegians and a Swede, but they all posses the same handsomely pale features, indistinguishable from each other. These characters are really generic. That even includes the intrepid star who should’ve been more exciting. Over three months, the team’s scientific voyage is met with a few small setbacks but it’s largely uneventful. Oh there’s storms, a shark gets on the boat, a whale almost topples the raft. Those developments are gripping so those moments engage. The cinematography is pretty too. But more often than not, the action focuses on the humans. Unfortunately their humdrum conversations are boring. The occasional infighting amongst the team does not a film make. Could this be the end of Spock? Captain James Kirk and Dr. “Bones” McCoy are running through a blood red forest on the planet Nibiru. They’re trying to leave while being chased by its inhabitants. They jump off a cliff and dive into the water below where the Starship Enterprise is hiding deep on the ocean floor out of sight. Meanwhile Spock has been lowered into a volcano with a cold fusion device. He intends to stave off a volcanic eruption there in an effort to preserve the planet and it’s denizens. But now Spock has jeopardized his own life. Kirk wants to save him but to do so he would have to break the Prime Directive and expose their technologically advanced ship to this primitive civilization. This would alter history, a definite no-no. The alternative is to remain hidden and allow Spock to die, something Spock himself is advocating. That‘s an incredibly heart pounding cliffhanger for the climax of a film. But that‘s merely the opening prologue. It’s but one of many set pieces in a relatively uncomplicated saga that concerns a terrorist that must be stopped. 2009’s Star Trek director J. J. Abrams is back along with producer Damon Lindelof (TV’s Lost) who also contributes to the screenplay this time. The producers have continued their gentle re-invention of the series much in a similar vein as the previous entry. The script doesn’t attempt to appease purists of the series. Chances are if you liked the last one, you’ll enjoy this. If you didn’t, then I’d stay clear away. The key players are back. Captain Kirk and Spock’s bromance seems to be even closer this time around as embodied by Zachary Quinto and Chris Pine. They have palatable chemistry. Plus, there are a couple of pivotal additions to the cast. I dare say that the already attractive ensemble gets just a little bit sexier. Hello Alice Eve! It’s got a spectacular villain in Benedict Cumberbatch. My goodness this man has a voice! The British thespian’s intonations resonate with all the power of a great orator. The plot works because the filmmakers start with good characterizations first and then build interesting situations from that. 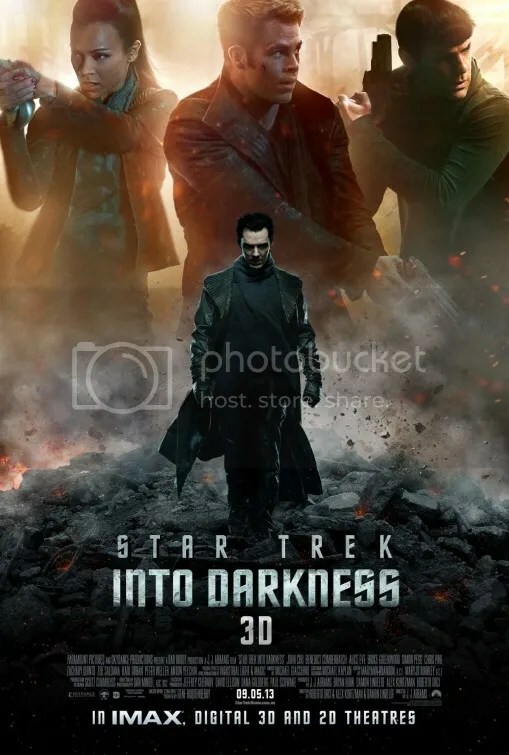 Star Trek Into Darkness is a model of how to create excitement. Abrams has wisely fashioned this adventure in the grand tradition of Hollywood blockbusters of yesteryear. That means it’s more concerned with classic narrative elements and character development than it is with lots of noisy action set pieces. Although there are some satisfying ones that take place in London and San Francisco. The chronicle is gripping. I was never bored, always captivated by what would happen next. There’s plenty of action, but it’s never at the expense of a coherent account that you generally care about. The script is quick and witty with a clear eye toward creating dramatic tension with pauses for the audience to catch their breath and delight in the repartee between these people. Scotty (Simon Pegg) and Bones (Karl Urban) have the funniest temperaments. It’s also a very pretty movie. It’s got plenty of attention grabbing cinematography with affected lighting techniques. Lens flares abound! Yes there are some admittedly cheesy (and familiar) story ideas: someone unexpectedly cries, people tenderly touch hands on either side of a glass wall and automatic seat belts looks like black square-shaped bugs crawling over the actors. But more often than not, the emotional connections to these well known personalities push this actioner into the realm of a drama that is extremely engaging. At one point, Spock selflessly commands the crew to teleport out of the ship to safety. When Sulu responds “With all due respect, sir, we’re not going anywhere!” I think I kind of shed a tear. From a sensory standpoint, The Great Gatsby is an unqualified success. Director Baz Luhrmann has once again married a modern soundtrack to a retro setting in another anachronistic move that also highlighted Romeo + Juliet and Moulin Rouge! I don’t mind the contemporary soundtrack produced by Jay-Z. In fact the hip-hop songs help heighten the excitement of the party scenes. Each soiree is a sensational wonder of Art Deco style. Digitized glitter and streamers fill the screen in a hyperactive techno dazzle display that is a visual and audible overload for the senses – a heady cocktail of debauchery, flowing booze and loud music. The camera swoops and dives amongst the glittering party people. Cuts are fast and furious. Two people talk and there are 10 edits to fortify the exchange. But the flamboyant choices give the production the emotional depth of a commercial advertising Moët & Chandon. The pace is frantic. We’re never really offered a chance to breathe and given the dramatic time needed to understand what makes these individuals tick. 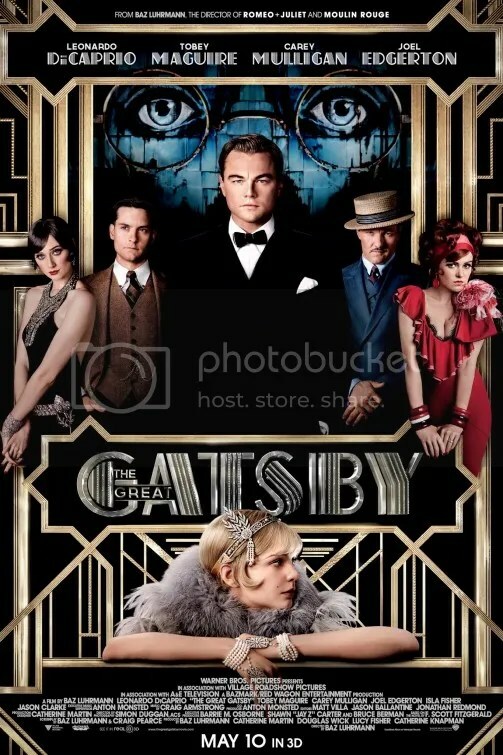 That party at Gatsby’s mansion is perhaps the most invigorating set piece in the entire movie. Although our main protagonist hasn’t even appeared yet. That’s a bit of problem in a drama called The Great Gatsby. Even when Leonardo DiCaprio finally does make an appearance, he feels more like a supporting character in his own story. Daisy Buchanan, as played by Carey Mulligan, is supposed to have inspired Gatsby in his lifelong quest to win back her heart. Unfortunately the narrative never presents a compelling reason why this woman has consumed his life. What works in a book does not always work on screen. Luhrmann’s slavish devotion to the novel hurts its cinematic chances to engage. Tobey McGuire as Nick Carraway is not the protagonist, but rather the first person narrator. He, in fact, occupies more screen time than anyone. He registers his approval, disgust, admiration to the audience on everyone. His constant narration is observing and commenting on what he sees. In the book he’s a poetic way to frame the chronicle, but in a movie, he’s a killjoy. He seems more like an interference than as someone who is helping the drama along. Baz has decided to have Nick writing the story of The Great Gatsby from inside a sanitarium while being treated for alcoholism. See F. Scott Fitzgerald’s words literally jump off the screen in 3D as Nick types them! It would be a perfect way to illustrate song lyrics for a pop music video. In this context, the static effect only serves to remind us we’re watching a dramatization from a distance. The device does nothing to draw us into the saga. The Great Gatsby seems destined to remain one of those unadaptable books. The beauty of Fitzgerald’s prose never seems to translate properly to the silver screen. Filmmakers have tried. This is the fifth adaptation of the classic work of American fiction. Published in 1925, The Great Gatsby is considered by many to be The Great American Novel. It details the acquisition of the American dream and the hollow facade behind those that have acquired it. Fitzgerald beautifully captured a cross-section of American society. He delights in capturing a time and place, namely the Jazz Age of the 1920s in Long Island, New York. Director Luhrmann certainly captures the look of an era. The art direction is beyond compare. The costumes are extraordinary. It’s without a doubt a technical marvel of resplendent opulence. But the attention to superficial details comes at an expense. The spectacle IS the story. The amplified style lacks any meaningful insight that would make these people interesting. It isn’t until a heated confrontation between Gatsby and Tom in a hotel that we form any connection to them as well as Nick, Daisy and Jordan – the rest of the primary cast. Sadly it’s near the end of the film. The production seems more concerned with minutiae like the large curl in Jordan’s black hair, than in what she is saying. “I just heard the most shocking thing. It all makes sense!” the golf pro coos early on at a party before disappearing without explanation. We’re supposed to care what she’s talking about. Strangely we don’t. 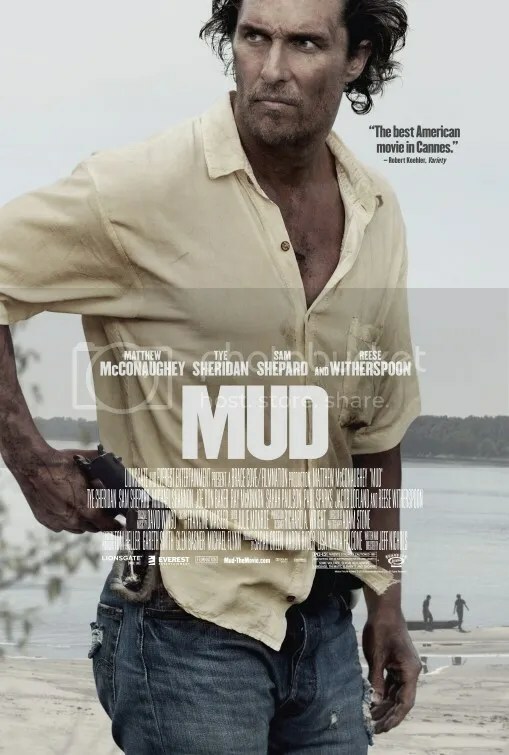 Matthew McConaughey’s name is ‘Mud’ in writer/director Jeff Nichols’ musing on southern life along the Mississippi River. Ellis and Neckbone are a couple of Arkansas teenagers who happen upon the drifter in an exiled status. Covered in a mixture of soft earth and water, Mud is aptly named. He’s a cursed man living a solitary existence, but he’s also a charismatic individual full of stories to tell. 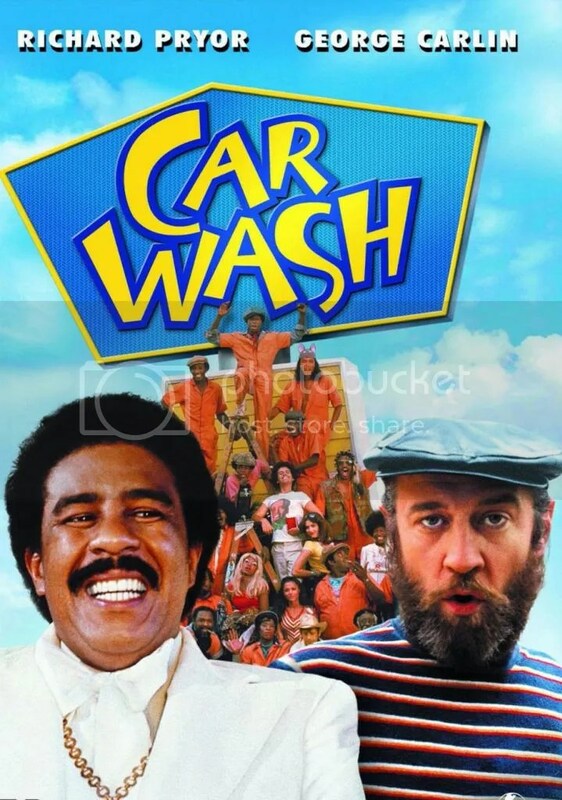 Ellis is intrigued with the strange plight of this homeless man and they embark upon an agreement whereby he swaps the promise of his boat in return for their help. Mud’s biggest selling point are the captivating performances. Matthew McConaughey can act. He’s been on a winning streak ever since 2011’s The Lincoln Lawyer. This role is up to the same high standard as every portrayal he’s given in the last couple years. He’s matched by two teens, the skeptical Neckbone (Jacob Lofland) and idealistic Ellis (Tye Sheridan). This is only Sheridan’s second credit (he played the youngest of the 3 boys in The Tree of Life). The authenticity of his work makes him a memorable actor. In the midst of Ellis’ interactions with Mud, we come to discover the tension between the teen’s parents at home is escalating. Ostensibly it’s “something to believe in” that causes Ellis to be so taken with his circumstance. Mud’s desire to reunite with his girl Juniper also becomes a mission of sorts for the young hopeless romantic. That a young boy would take on the problems of a stranger in the name of true love is not particularly believable, but it is curious at least. Juniper, on the other hand, is so nondescript it’s inexplicable why the role attracted a major star. Incidentally, Reese Witherspoon adds nothing to the underwritten character. Mud is a nice little slice of Americana and it’s got some beautifully written dialogue showcasing McConaughey and the two boys. It’s not obvious initially, but turns out the movie’s main purpose are the exchanges that Mud has with the boys. The boys are articulate and McConaughey is charming, as usual. I was captivated for the first half. But as things progress, the pervading sluggishness becomes tedious when contrasted with the script’s flirtation with thriller elements that never really transpire into anything significant. It’s an adolescent coming of age story with the stereotypical thrust into adulthood. The derivative ingredients ultimately prove to be too insubstantial to support a film that runs over two hours. As we learn more about Mud and the boys, the less intellectually satisfying things become and we realize it’s the conversations themselves that are supposed to captivate us, not some revelatory event. The seemingly unending discourse makes the genre action climax all the more puzzling. It’s almost as if the screenwriter felt compelled to punctuate a mood piece of southern charm and flawed characters with something lively. 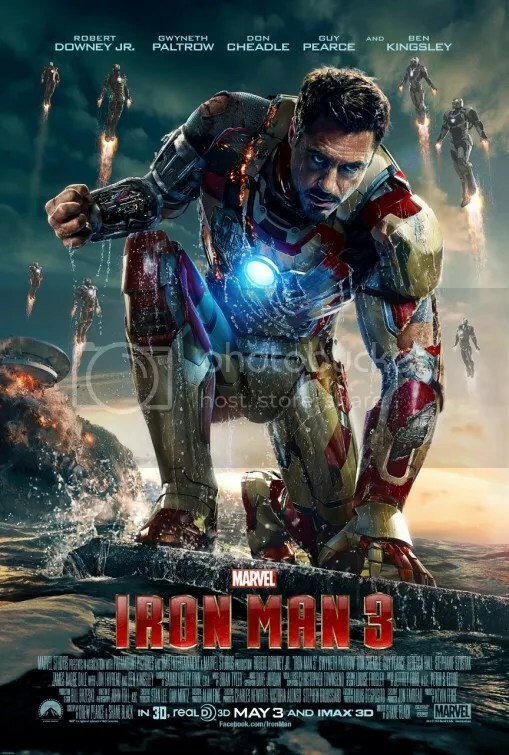 As a fan of writer/director Shane Black, I see Iron Man 3 more as the long awaited follow-up to Kiss Kiss Bang Bang than part two in the superhero franchise. Don’t get me wrong. I enjoy the Iron Man series just fine, but it’s the writer’s wit that captivates me more than awesome technology. In both respects, Iron Man 3 does not disappoint. An enigmatic terrorist known as The Mandarin (Ben Kingsley) has taken control of the U.S. broadcasting signal. He has claimed responsibility for a string of bombings across the nation and ultimately threatens the safety of the President. The threat becomes personal when Tony Stark’s security officer Happy Hogan is gravely injured in one of the attacks. As is usually the case in these Iron Man movies, multiple characters abound. Jessica Biel Rebecca Hall plays a botanist who manipulates DNA to reproduce the limbs of plants. Guy Pearce is also on hand as brilliant scientist Aldrich Killian, who continues to harbor a bitter resentment well after Tony had rebuffed him years before. He’s currently involved in scientific work isolating and empowering certain areas of the human brain. But the most welcome addition is a young Tennessee boy named Harley (Ty Simpkins) who is sort of an amusing foil for Robert Downey Jr. They’ve got great chemistry as a comedic team in the couple scenes that they have together. I’ve never taken to superhero films that take themselves too seriously. I was one of the few that actually appreciated Iron Man 2 over the original. And this time around, I think I preferred this to part two. With Tony Stark as a lead portrayed by Robert Downey Jr., all of the Iron Man entries have been infused with a lighthearted touch. Its charm helps make this superhero picture a lively romp. Shane Black does a brilliant job at keeping the series light and fun while injecting enough of the requisite dramatic struggle that seems to afflict all superheroes. His major battle with The Mandarin is underscored by juggling relationship problems with girlfriend Pepper Potts and post-traumatic stress related to the events documented in The Avengers. While not particularly deep, the ideas help make the character a bit more complex than simply a generic champion for righteousness. If there is a failing, it’s that the action reverts to a conventional big loud explosion fest at the end. It’s still entertaining. I only wish the story had been as clever as the dialogue. That’s ultimately what makes this the funniest Iron Man yet.